Diatonic scale on C, equal tempered and just . Pythagorean diatonic scale on C . A plus sign (+) indicates the syntonic comma. The modern piano keyboard is based on the interval patterns of the diatonic scale. Any sequence of seven successive white keys plays a diatonic scale. The diatonic scale is one of the scales used in music. It is also called heptatonic scale, because it uses seven distinct pitch classes, or tones. For each octave there are five whole steps and two half steps. The two half steps are separated by two or three whole steps. The word "diatonic" comes from the Greek διατονικός, meaning progressing through tones. This property of the diatonic scale is called Pythagorean tuning. It was historically relevant and contributed to the worldwide diffusion of diatonic scales, because it allowed musicians to tune musical instruments easily by ear. Any sequence of seven successive natural notes, such as C-D-E-F-G-A-B, and all transpositions, are diatonic scales. Piano keyboards are designed to play natural notes, which are diatonic scales, with their white keys. A diatonic scale can be also described as two tetrachords separated by a whole tone. The term diatonic originally referred to the diatonic genus, one of the three genera of the ancient Greeks. In musical set theory, Allen Forte classifies diatonic scales as set form 7–35. harmonic minor or the melodic minor. 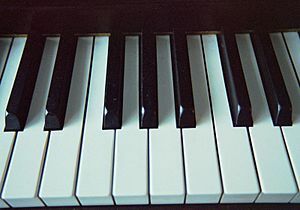 The sequence of eight white keys on the piano is not diatonic, because there is a third half step, which is usually between the seventh and eighth note. This scale is called whole-tone scale. Another example for scales that are not diatonic are the Gypsy scales, which are often used for folk music. Diatonic scale Facts for Kids. Kiddle Encyclopedia.